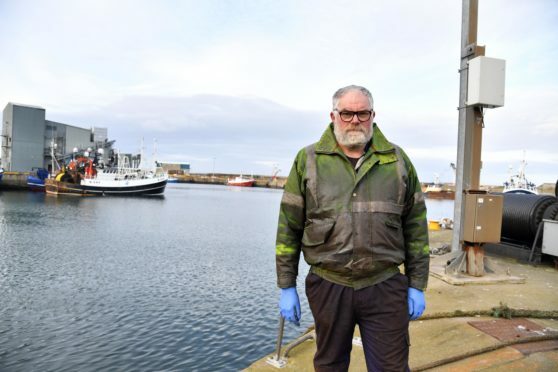 Mechanic Mark Reason is worried about the amount of oil slicks in Fraserburgh harbour. A harbour work has claimed oil and diesel is being regularly dumped in the water at Fraserburgh – and urged skippers to show “respect”. Mark Reason is a ship lift mechanic at the port, and claims there are often slicks. He believes that despite a ban on dumping fuel, some boats are doing it anyway which leaves the equipment he works on covered in oil. But last night, Fraserburgh Harbour Commissioners – who look after the dock – said strict rules are followed in accordance with the Scottish Environmental Protection Agency (Sepa) and the Maritime and Coastguard Agency. Mr Reason, from Strichen, however, insisted there is a problem at the harbour which is used by fishing boats, cargo vessels and the renewables industry. He said: “It is happening on a weekly basis. “They’re not supposed to empty in the harbour but they are doing it anyway. “I think we need pride in our harbour and respect for the people who work there. “They shouldn’t be covering it in fuel and this stuff should be barrelled and dumped properly. But harbour chairman Michael Murray refuted the claims and said safety was “paramount”. He added the team regularly check their oil spill procedures and carried out a mock incident exercise just days ago. Mr Murray said: “We deal with Sepa and all of our procedures are endorsed by the MCA. “I find it strange he has commented when we just carried out oil spill exercise last week. “Even small spills are dealt with and there is no dumping of oil.